Reflections on sacrifice, bravery at JA National War Memorial Court. Aiden Kaneshiro and Brendan Ikeda clean the Japanese American National War Memorial Court on Oct. 28 at the JACCC. 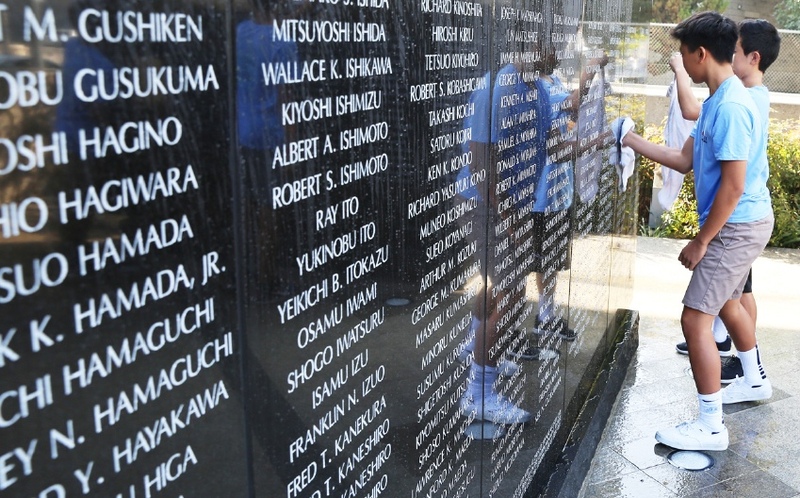 The monument honors Japanese American soldiers who have made the ultimate sacrifice. Stories from the past cannot be relived by those of the present but they can be remembered for the future. On Oct. 28, a community service project, Spit and Polish, was held in front of the Japanese American Cultural and Community Center in Little Tokyo. 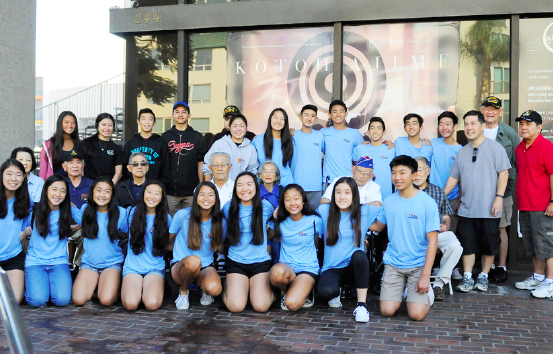 Twenty-two young high school students attended the event at the Japanese American National War Memorial Court to give back to the Japanese American community. With a little hard work, the memorial sparkled in the morning light to remember Japanese Americans who were lost in various wars: World War II, Korean War, Vietnam War, and many modern-day wars. While polishing the memorial, names became spirits surrounding us and telling us their stories of sacrifice and war. The deceased weren’t much older than I, who grew up with similar backgrounds to those lost. These men on the walls lost their lives so that their community could have a better one. The memorial holds a special place in my heart as we make sure it can also live in the heart of Little Tokyo to assist us in remembering the past. Ken Hayashi, a Vietnam veteran, speaks to the students. Following the memorial’s cleaning, many veterans and volunteers were led upstairs to learn about some of the stories of the veterans and the people on the wall. Two vets who impacted me with their stories were Jim Yamashita and Minoru Tonai. 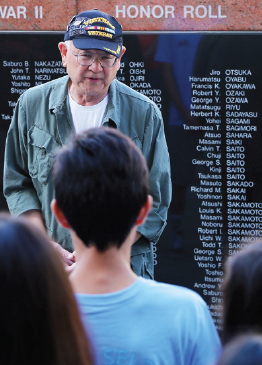 Mr. Yamashita’s story let me into just one of the 442nd veteran’s many experiences. He was born in Irvine and was forced to move because of the Alien Land Law, which prohibited Issei from buying and owning land. He moved with his family to eastern Nevada and lived in a Mormon community. When World War II approached and Japanese Americans were being sent to internment camps, Jim was not interned because of his loyal neighbors, who told the government not to take them away. But, when he turned 18, he was drafted into WWII and joined the 442nd Regimental Combat Team, a segregated unit that primarily consisted of Japanese American soldiers and is one of the most highly decorated units in U.S. history. Altogether the 442nd earned 21 Medals of Honor, which is unheard of in American history, many of the soldiers left their families in internment camps and went to fight for a country that imprisoned their families and took away everything they owned and worked so hard to accomplish. Jim remembers that one of the soldiers’ last words on the battlefield were “Okaasan, okaasan” (Mother, mother). It brings me to tears to think that these soldiers probably would never see their interned families again as they sacrificed for their country. The other veteran I met also impacted my view on my history and heritage with his story as well. Min Tonai, a Korean War veteran, explained to me what his life was like before and after the internment camps and why he fought for America. Min was born in San Pedro and his father owned a large, successful business of produce stands. His father was also a leader in the Japanese American business community because of his business success. When the FBI rounded up all the leaders in Japanese American communities, Min’s father was taken away to a separate Justice Department camp, and they would not see him for another three years. His family, without his father, soon moved to L.A., near their office, so that his mother could keep the business going until they were evacuated to the camps. The students and veterans gather for a group photo. His mother kept all of the stands open, even if the customers were not coming, so that the employees would have their paychecks to support their families. She looked upon the employees as family, as they do in Japan, and they needed to be taken care of. By paying off all of their debts, Min’s family was essentially destitute by the time they were sent to camp themselves. The government and the Army told them to take their minimum allowed baggage and go to the Santa Anita Assembly Center. The reason was that the bombing of Pearl Harbor by Japan led to a lot of prejudice towards Japanese Americans. Therefore they were to be sent to a place where they could be “protected” and “guarded,” they were told. Min said that when he arrived at Santa Anita, they were housed in the horse stables, the worst place he ever lived, even worse than on the front lines of Korea. When he saw ten-foot-tall barbed-wire fences and watchtowers with machine guns and searchlights pointing inward instead of outward to protect them, Min was scared of the fact that there were MPs manning those towers with guns that looked as if they would shoot you, and realized the reality of the situation that all West Coast Japanese Americans were beginning to face. Min was 13, the SAME age as myself a year ago, and he was sent to the camps to live. I can’t imagine losing everything and being interned, like these very people I met. The camps have caused Japanese Americans to become different people. When Min was released, he soon went to college at UCLA and was drafted into the Korean War when he was almost 22. He fought in the war as a medic and told us about a buddy whose name is on the wall and what happened to some of those people on the memorial. Jim, even though you weren’t in an internment camp, how did you feel still fighting for America, the very country that interned thousands of Japanese Americans? How and why did you still fight? Although Japanese Americans had their civil rights taken away from them, Jim and all the others in the 442nd fought to change America’s outlook on Japanese Americans. The 442nd was going to prove that Japanese Americans were just as loyal as any other American although their own families were being imprisoned. To them, the whole internment was a horrible mistake in U.S. history, but the 442nd was there to fight and prove them wrong. The young Japanese Americans had so much courage to fight while their families were trapped in camp. Their bravery and sacrifice is something I got to learn about first-hand from a veteran. The 442nd and 100th Battalion showed so much loyalty to America and sacrificed everything, even their lives, to prove that. He was one of the many who experienced the injustice Japanese Americans faced when they were interned. Yet, when he was drafted, he could not resist the draft. He explained to me that the 442nd fought hard and extremely bravely and earned 21 Medals of Honor to change the reputation of Japanese Americans. Min said that not fighting and serving America would have been a huge disgrace to the 442nd, who risked and lost their lives to fight the injustice. He saw fighting in the war as parallel to the bushido code of the samurai. Even if they didn’t necessarily agree with everything their feudal lord did, they would still fight for honor and to honor those who came before them. Before attending Spit and Polish, I only heard stories about my grandparents and heard small things about the 442nd and the battles they fought. After meeting veterans in person and learning their story, I am so grateful for the life I have and what the 442nd and 100th Battalion accomplished for our communities today. One thing I take away from this, and hope you can too, is that all of these Japanese American veterans, from World War II to the Iraq War, have risked and lost their lives fighting for our country and for the Japanese American life we have today. All of these soldiers and veterans have different stories to tell whether they are dead or alive. I know now it is our job to keep not only our Japanese heritage alive in our communities, but the stories of those around us who help shape the lives we are fortunate to have today. I know now that it is our generation’s job to keep stories and meaning in the hard fight that people like Jim and the other veterans faced. I want to, and hope you too will want to, keep their stories alive, even after they have fallen.